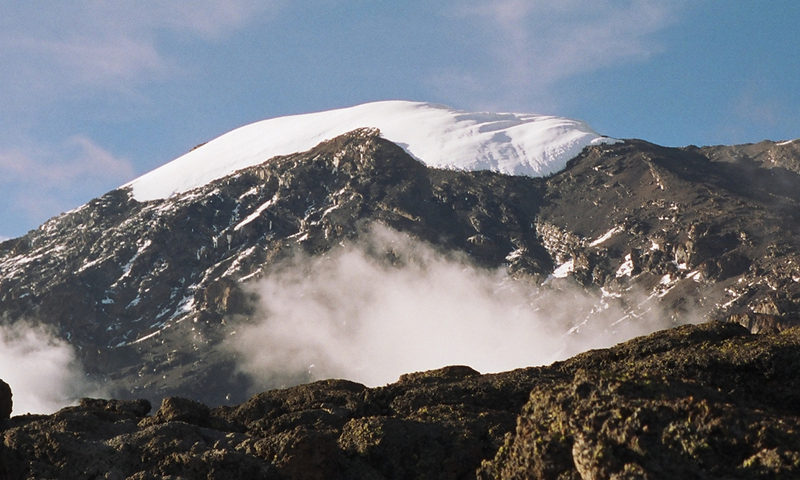 The most popular route on Kilimanjaro! 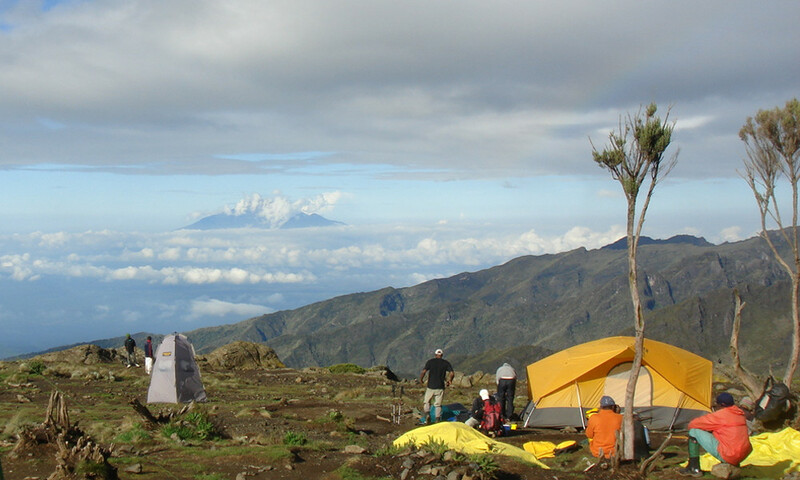 The Machame route highlights includes great hiking through all the unique ecological zones, fantastic views, and camps that are appropriately spaced for acclimatization. 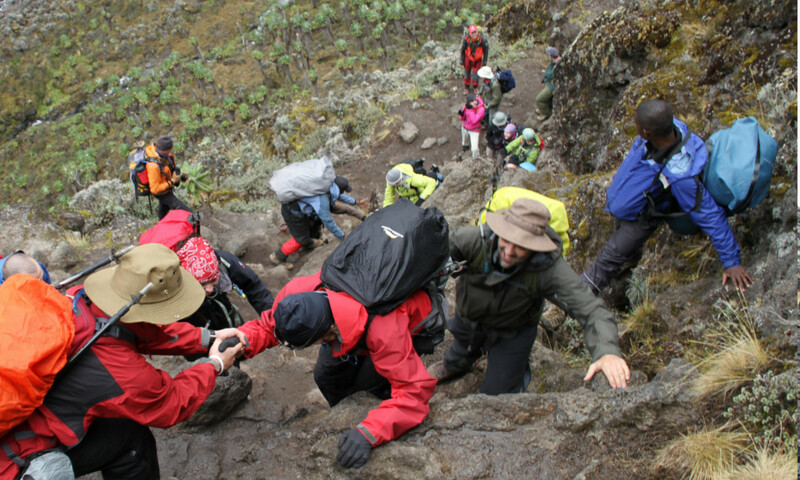 The Machame route is a little shorter and more direct than the Lemosho route and therefore slightly more challenging. The Machame Gate has a starting elevation of 5,380′, this park entrance has a well developed picnic area complete with restrooms for guests to enjoy while your guide sorts out permits with the park rangers. From the Machame gate we’ll start our climb through Kilimanjaro’s rain forest to the Shira Plateau, from here the route converges with the Lemosho route. 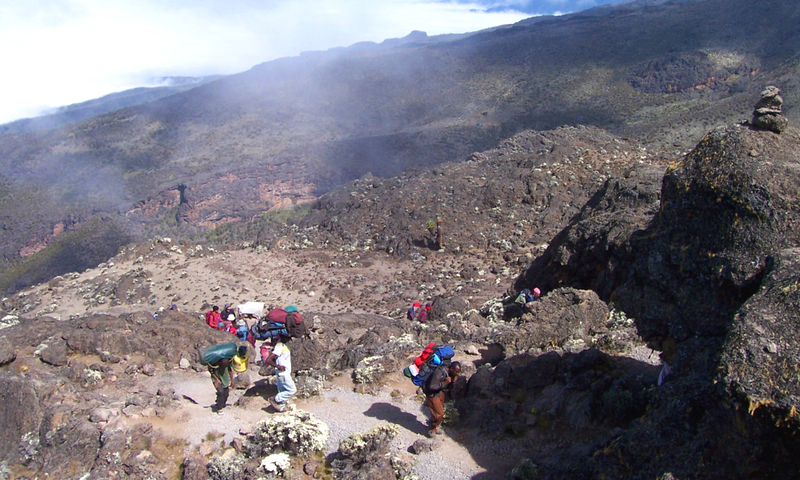 The Machame route features the impressive Barranco Wall and Lava Tower, both well known landmarks found on Mt. 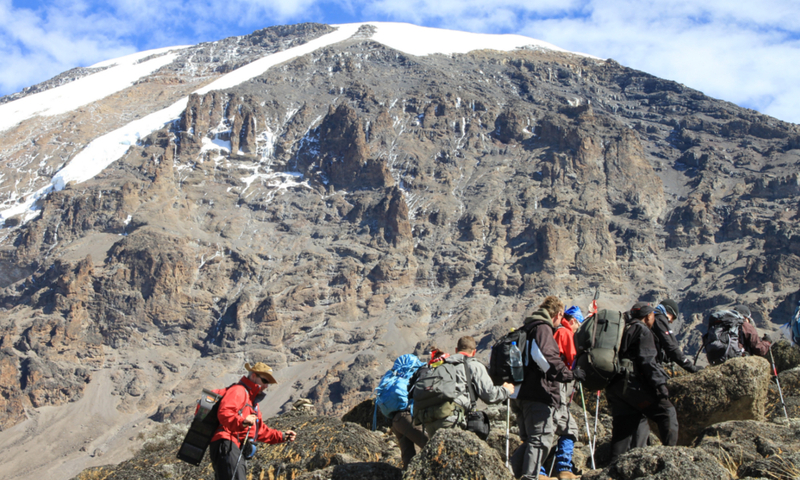 Kilimanjaro and unique to the Machame and Lemosho routes. From the Barranco Wall guests often stop to enjoy the scenic view including a look at the nearby Meru Peak. 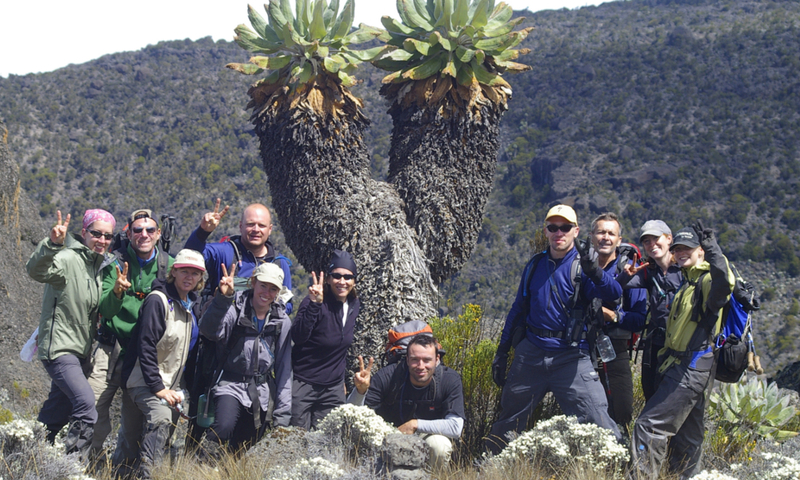 The Machame Route is a unique and unforgettable experience! GETTING TO THE MOUNTAIN: Day 1 of our journey up Kilimanjaro features a short drive to the Machame Gate. After sorting out permitting and local support with the park rangers we’ll begin our trek to the first camp. The Machame Route is a 10 day itinerary, including travel and rest days in Moshi. MGI factors travel and rest days in Moshi into our itinerary to help ensure optimal acclimatization and enjoyment of your time on Kilimanjaro. – TRAVEL: Depending on flight times and connections, travel to Moshi, Tanzania typically takes over 24 hours from the U.S. including a stop in Amsterdam or London. Please be sure your arrival in Tanzania coordinates with the first day of the program. DAY 1: TRAVEL DAY This is the start date indicated with all our trips. We’ll pick you up from Kilimanjaro International Airport, flights from Western countries typically arrive around 9:00pm local time. The drive from the airport to the Springlands hotel is about 45 minutes. We’ll get you settled in to your accommodations and give you details on breakfast and the Day 2 itinerary. DAY 2: MOSHI After a long travel day you’ll have the opportunity to rest and relax at the Springlands Resort. Your guide will coordinate a group meeting where we’ll cover introductions, answer questions about the trip, and ensure everyone has all the necessary gear. Guided tours of Moshi can be arranged by your guide through the Springlands staff, it is a great opportunity to see Moshi and pick up souvenirs. DAY 3: MACHAME CAMP(9,750 ft) After breakfast we will drive about an hour to the Machame gate, which is the start of the climb. Here we sign in with the national park authorities and begin hiking. The trail here is in great shape and winds uphill through the tropical rainforest for 5 to 6 hours before reaching Machame Hut. The views from our first camp are fantastic. DAY 4: SHIRA PLATEAU(12,480 ft) We typically depart Machame Camp at about 8 a.m. and enter alpine vegetation shortly thereafter. In the distance we can see the first close-up of the snow-capped summit. This is a great day of gradual hiking through fields of heather. At around 10,000 ft. we begin to see the first Lobelia, Protea and giant Senecia plants. This is another 5 to 6 hour day. DAY 5: BARRANCO CAMP (12,850 ft) Today we hike up over a high ridge, and then descend to Barranco camp. This day includes a stop near the Lava Tower where we’ll enjoy lunch in our covered dining tent. Our camping elevation does not change much, but the hike to almost 14,000 feet, helps with acclimatization. Barranco camp has a great view to the south over Moshi. 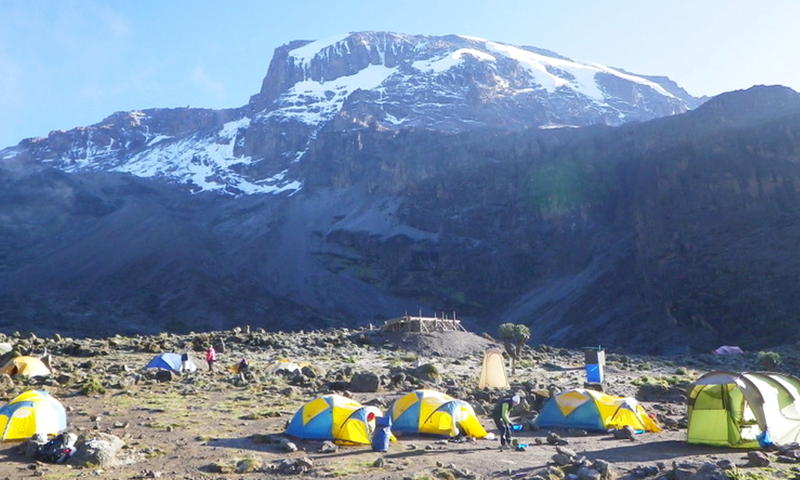 DAY 6: KARANGA VALLEY (13,200 ft) Most groups will move to Barafu camp on this day. However, we believe its best to spend an extra day at Karanga to aid in acclimatization and to make the summit day easier. This is a 4-hour day. DAY 7 : BARAFU CAMP(14,950 ft) We reach Barafu in about 4 hours. Here we will have lunch, and rest until dinner. Then we will sleep until midnight, when we’ll mobilize for summit day! DAY 8 – SUMMIT DAY: Rising early, groups enjoy a light breakfast before hitting the trail. It will take 6 or 7 hours to reach the crater rim. Sunrise on the summit crater is going to be something to remember forever. The sun rising over the plains of Africa and diffuse lighting on the nearby glaciers is truly a world class experience. We will continue along the rim for another hour or two before reaching the highest point in Africa, (19,340 ft). Congratulations! We’ll enjoy the view from Uhuru peak before beginning our descent back to Barafu Camp where we’ll enjoy a meal and some rest before continuing down the normal route to our last camp on Kilimanjaro. DAY 9 – RETURN TO MOSHI In the morning we’ll depart camp for the park gates, it usually takes 3 hours from Millenium Camp to exit the park. We’ll meet up with our ride back to town and sign out with the park rangers, receiving summit certificates to commemorate your achievement in reaching the summit! Back at the Springlands Resort you’ll get settled in, enjoy a refreshing shower and a well deserved beverage. DAY 10 – DEPARTURES/SAFARI We’ll arrange your transfer from Springlands to the airport or out onto your safari. For a complete look at the itinerary click this link.